September 30th saw one of the Ripper’s most audacious acts, known as the Double Event. 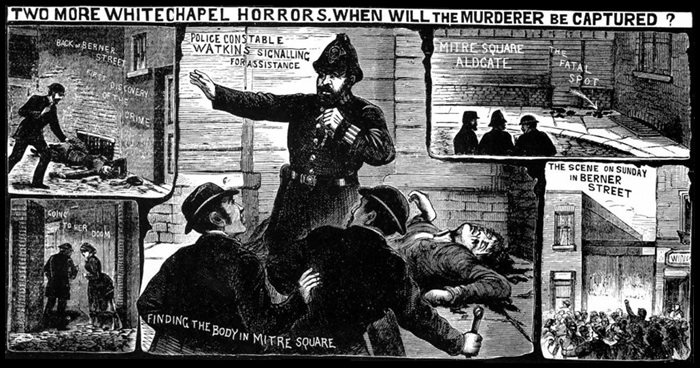 Occurring three weeks after the murder of Annie Chapman, the soggy, miserable night saw the murder of two women within less than an hour: Elizabeth Stride and Catherine Eddowes. Berner Street was in the Whitechapel district off Commercial Road, and was populated by mostly Polish and German tailors, cobblers and other modest craftsmen. The International Working Men’s Educational Club was located at no. 40 Berner Street, and was a socialist club made up of mostly Russian and Polish Jews. The front of the club opened up to the street, but there was also a kitchen door around the side in Dutfield’s Yard. A gated (and extremely dark) passageway closed off the yard, but the gate was often left open into the late hours of the evening while members of the club were still present. On Saturday nights, the club usually hosted free talks that packed the building full of people. The evening of the 29th, between 50 and 100 people had shown up for a talk called “Why Jews Should be Socialists”, and dozens of men had stuck around after the talk to socialize and sing. At 1 am, the steward of the club, Louis Diemschutz, steered his pony and 2-wheeled barrow into the passageway between number 40 and 42. The party was still roaring inside, and light and sound dimly illuminated the alley. When the pony shied to the left, almost knocking into the passage wall, Diemschutz halted to investigate. He saw what he recognized as a woman laying on the ground facing away from the center of the passage. Before investigating any further, Diemschutz became worried about his wife and rushed inside to check on her. Surprised by his frantic inquiries, the men inside assured the steward that Mrs. Diemschutz was fine, and asked what the problem was. Many have speculated that the pony was actually scared because it saw a man duck swiftly into the shadow of the alley. Further, some say that, had Diemschutz stayed in the passageway rather than rushing indoors, he may have caught sight of the Ripper himself. A young tailor named Isaac Kozebrodski accompanied Mr. Diemschutz outside, while Mrs. Diemschutz stood in the doorway of the kitchen and watched. When Mr. Diemschutz shone the light of his candle on the woman’s face, Mrs. Diemschutz saw blood trickling up from the body into the yard along the gutter, clotting into a pool near her pallid face. The group of men dispersed into the neighborhood crying out for police. They went up Fairclough Street and back down again, coming into contact with a horse-keeper named Edward Spooner, who came along to investigate what had happened. Three quarters of a mile away, just a twelve-minute walk, laid Mitre Square, inside the eastern boundary of London city. During the day, the 24 yard square was full of people conducting business. During the night, however, only a few residents lived in neighboring row houses. These included George Morris, a retired police officer and watchman, George Clapp and his wife, and PC Pearce. The latter three people were in bed well before the second murder of the evening transpired in the square. 1:30 am saw PC Watkins walking his beat in East London, which took him through Mitre Square itself. Ten minutes later, PC James Harvey walked by Mitre Square in his loop along Duke Street and Church Passage. Though he did not pass through the square itself, he was near enough to see into it and hear whether anything suspicious may have been going on. Neither man heard or saw anything out of the ordinary. PC Watkins’ walk only took about 15 minutes to complete, and at 1:44 am, he again was walking through Mitre Square. This time, however, he shone a lamp to his left side and discovered the body of a woman, lying on her back with her feet facing into the square and her skirts pulled up to her waist. Her throat was cut and she was also disemboweled, the entrails lying next to her mutilated face.